Punish enemies with elaborate summons. Master new moves with Bayonetta's trademark style! Utilize new weapons and skills in battle! Partner up with a friend online! (Broadband Internet access required for online play). 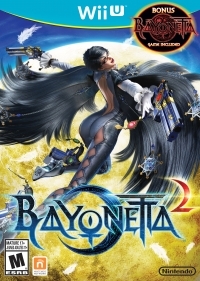 Includes a disc of the original Bayonetta game, now on Wii U! 12-05-2015 grahf16 Box Text Angels and Demons Stand In Her Way Carry out exhilarating combos! Punish enemies with elaborate summons. Master new moves with Bayonetta's trademark style! Utilize new weapons and skills in battle! Partner up with a friend online! (Broadband Internet access required for online play). 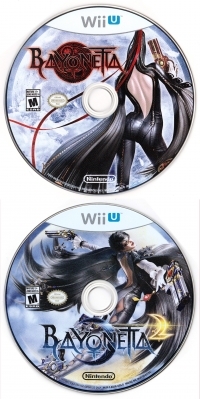 Includes a disc of the original Bayonetta game, now on Wii U! This is a list of VGCollect users who have Bayonetta 2 (Bonus Bayonetta Game Included) in their Collection. 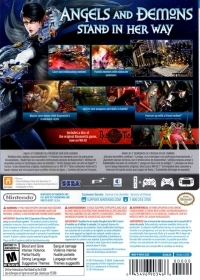 This is a list of VGCollect users who have Bayonetta 2 (Bonus Bayonetta Game Included) in their Sell List. This is a list of VGCollect users who have Bayonetta 2 (Bonus Bayonetta Game Included) in their Wish List.